Tuck Muntarbhorn is a British-Thai artist based in London and Bangkok. His ‘light paintings’, often six foot squares, reflect his belief that "the highest function of an artist is to make beauty manifest". Prior to establishing himself as an artist, Muntarbhorn co-founded the international semi-couture brand Busardi in 2009 which exhibited during Haute Couture Week in Paris. In 2017, Muntarbhorn became the first Thai artist to speak on a TED stage in the UK (TEDxSOAS). 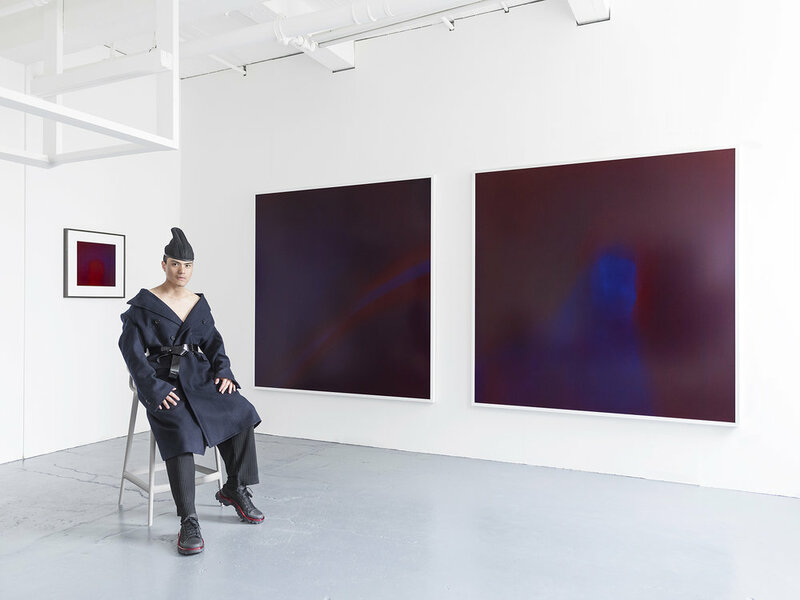 In 2018, Muntarbhorn launched TuckSpace, his first spiritual art space in London - home to his series The Holy Land until 2023. His works can be found in private collections in Brazil, Canada, France, Italy, Singapore, Thailand, Turkey, the UK and USA. In 2019, Muntarbhorn launched his own media platform, TuckTube. Nothing about Tuck Muntarbhorn is conventional. From the word ‘go’, he invites engagement. He doesn’t want to hide behind the mask of ordinariness; he wants something to happen. His artistic practise is a pretext for communication, a stage for indeterminate encounters. But while Muntarbhorn is thoroughly committed to projecting his vision into the world, each of his works creates a perfumed space that is impossible to control or capture; it is there till it dissipates and is made again. Taken together as a series, his photographs constitute a continuous meditation on the luminous transience of forms, guided not by preconceived ideas about outcomes but by the very process and materials of making. Thus while each image is minutely prepared, the long exposures that each one involves create an empty or surrendered space, such that the process itself is ultimately left to ‘grace’. Muntarbhorn is transparent about the fact that his work is an expression of his feeling for the spiritual nature of the world. Originating at sacred sites from across the globe (in Thailand, Myanmar, India, Israel, Finland, Britain and elsewhere), the forms he photographs become abstract to the point at which they dissolve into transparent bodies of light; they relinquish their otherness. Simulating the experience of meditation, they move in and out of the field of perception, in front of which the mind is invited to forget itself. At once contemplative and highly attentive to the micro-details of production, they find the point at which the possible becomes necessary. While Muntarbhorn’s work is primarily intuitive and experimental, it chimes across time, and pays homage to the masters of the ‘northern Romantic tradition’ - from Friedrich and Turner to Whistler and Rothko. It is significant therefore that his inspiration also comes from the torrential contemporary ‘sublimes’ of Leonardo Drew, Ursula von Rydingsvard and Henrique Oliveira, in whose ‘extreme’ sculptures the materials themselves come alive, at once intelligent and overwhelming. The common ground is nature. The force that causes volcanoes to erupt is the same force that enables the stars to be duplicated to perfection in the eternal stillness of a mountain pool. Muntarbhorn is a young artist. He is riding a rising wave. He is not ashamed to be excited like a child by the infinite possibilities that the experience of life offers; he is not in doubt about the amount of expressive freedom he is entitled to imagine. Although he clearly feels the currents of creativity in himself, they are not him or his; it is to the world that they belong and through his work that they pass.